Chicago Review Press, 9781569765326, 144pp. The story of California is the story of dreamers—explorers, gold miners, immigrants, ranchers, moviemakers, farmers, and everyday Americans who headed west for a fresh start. The first native inhabitants arrived 9,000 years ago, ancestors of the tribes who would greet the Spanish in the 1700s. Father Junípero Serra later established a chain of missions along the coast, expanding European and Mexican influence. But when gold was discovered in 1848, the rush was on, and two short years later California became a state. After the gold ran out, other rushes followed, from agriculture to industry, Hollywood to Silicon Valley. 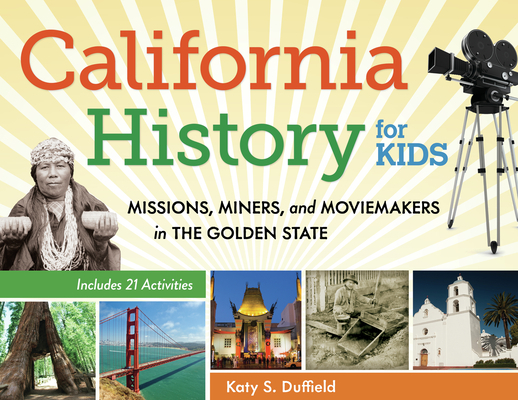 Author Katy Duffield tells the rich story of the men and women who, despite challenges and occasional hardships, settled and built the vibrant cities and bountiful farms, ranches, and orchards of the Golden State. Katy Duffield is the author of the picture book Farmer McPeepers and His Missing Milk Cows and five nonfiction library reference books for older readers. She has also written for numerous children’s magazines including Highlights for Children, Appleseeds, Hopscotch, and Clubhouse.